Monday 30 October 2017 is a bank / public holiday in Ireland. It is also the weekend when most Halloween events happen, and the end of Irish daylight savings time. Bus Éireann and City Direct will run their their standard Sunday city services in Galway on Sunday 29 and Monday 30 October. There may be slight delays in the city centre for routes 401, 402, 405 and 407 at around 5 - 6:30pm, due to Port na bPúcaí, the Halloween Macnas Parade. One Bus Éireann Dundalk / Galway return service is cancelled on Sunday 25th. On Monday 27 October, Bus Éireann will operate a Sunday timetable with except that some services will run according to a weekday timetable. See their announcement for details. BusLink will run NiteLink services to/from Athenry on Friday, Saturday and Sunday evenings. GoBus have announced on Facebook that they will run a regular Sunday timetable on the 29th, except that the 7:45pm bus from Galway will not operate. Daylight Saving officially ends at 2am on Sunday 26th October, when the clocks to back to 1am. 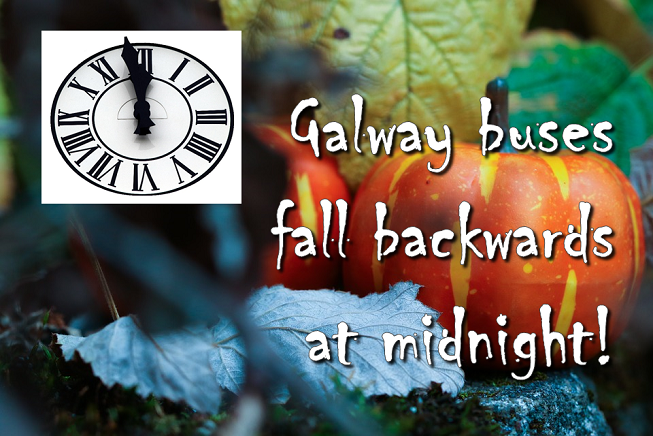 Both Galway bus companies that run overnight services have advised customers to adjust their watches at midnight on Saturday night: services that leave after midnight will run at "winter time" times. A normal Monday service will run on 30 October, with some cancellations. In other parts of the country, trains will be replaced by buses due to engineering works. For full details, see their October Bank Holiday train timetable.